Situated adjacently to the main house, the charming Garden Room provides a peaceful and comfortable space for you to relax and unwind during your stay in North Norfolk. Available as Thursford Bed and Breakfast accommodation, with delicious home cooked breakfasts offered every morning, a stay in the Garden Room will leave you refreshed, revitalised and ready to explore the wonderful sites that Norfolk has to offer. The Garden Room is a haven of tranquillity, as the French doors and skylights provide huge amounts of natural light in the bedroom and living area, along with beautiful views of the lovingly nurtured garden and vegetable patch. A private entrance to the property ensures that you will have privacy to come and go as you please, with parking available in the gravel drive. The living and bedroom area provides a warm but spacious atmosphere, due to the rooms high ceilings and traditional log burner (complete with log supply) for the colder Norfolk evenings. A plush sofa and armchairs provide no end of comfort, along with a TV, DVD, stereo and selection of books and DVDs for your entertainment. The large 5ft bed provides luxurious 100% cotton sheets for ultimate relaxation after a hard days walking or exploration of the countryside. The underfloor heating follows through the corridor to the personal bathroom, maintaining the warm aura of the room. 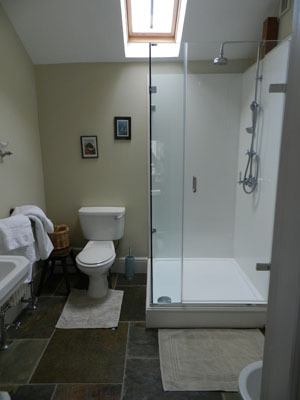 This bright and airy shower room is complete with a large powerful shower, heated towel rails. Whilst staying with us you will be able to enjoy a home cooked breakfast every morning, with a variety of choices from fresh juice, yogurt and granola, to muesli, homemade jams and wonderful cooked dishes also available. The breakfast is served in the sunlit conservatory, or if the weather is warmer – outside on the patio overlooking the garden. For larger parties the Garden Room and Guest Room are available to be booked in conjunction with the Garden Barn, with the option to forego breakfast and have joint use of the Barn’s kitchen facilities, please do not hesitate to contact us so we can tailor the accommodation specifically to your needs. During your stay in the Garden Room you are invited to make use of the beautiful communal garden, with plenty of covered seating and a variety of green roofed buildings. There is also a drying room and outdoor sink, perfect for rinsing and drying sandy clothes and boots after a long days exploring!